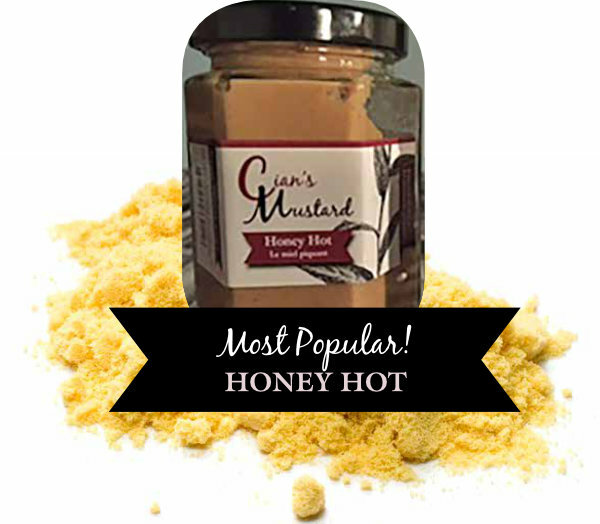 Recipe Submission: by Sharon M.
Mix equal parts of Cian’s Honey Hot and mayo, add fresh lemon juice. Spread mixture on top of salmon and bake. (Tip: cook asparagus for a few minutes to soften before placing on baking tray). Add salt and pepper all around and bake at 375 until salmon is done (aprox 15 -20 min depending on thickness). Use run off from sauce will tasty up those shrimp. Heat oven to 400˚. Using a 2″ round cookie cutter, cut out 24 circles from bread slices. Brush both sides of each circle with butter and transfer to a baking sheet. Toast bread in oven, turning once, until light golden, about 10 minutes. Meanwhile, combine ham, mayonnaise, relish, salt and pepper to taste, and mustard in a small bowl. Spread about 1 tbsp. ham spread on each toast circle and top each with half an olive. Want more mustard recipes? Click here to sign up for our monthly newsletter and get them delivered directly to your inbox!